Cement silo is storage and supply system for powder in cement concrete mixing station SC series power storage is composed mainly of capsule, bracket, warehouse top dust catcher, arch breaker system, discharging door, material level meter, gym, etc. Cement silo is used to store the powder, generally according to user’s actual situation to determine choose quantity, 2 to 4 cement silo. There are upper and lower level indicator in the body, one is located in the top of the capsule cylindrical part; Another is located in the bottom of the cylindrical part, and is set to the lower limit of a state, empty action. The user can judge whether fodder is full or empty by light. Cement silo play an important role in the cement mixing station, so we design cement silo with environmental dust removal system. 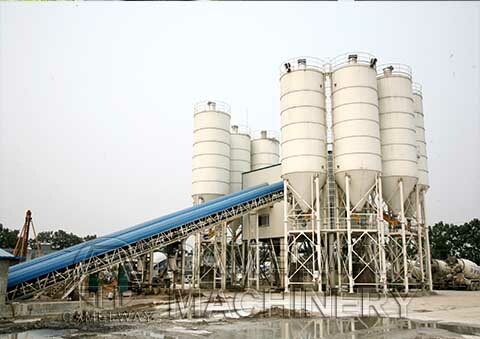 As a China-based professional hopper concrete mixing plant manufacturer and supplier, Zhengzhou CamelWay Machinery manufacture also provide screw conveyor, concrete mixer truck, concrete block making machine, concrete mixing plant and cement silo, etc. All our products are manufactured strictly according to the ISO9001 quality management system, resulting in reliable quality, so you can feel secure in choosing our construction machinery. Due to their reliable performance, our products are highly praised by Vietnam, Laos, Kazakhstan, Mongolia, Russia, Cuba, Brazil and other countries. For more information about any of our products, please feel free to contact us or at the contact addresses available on this website.